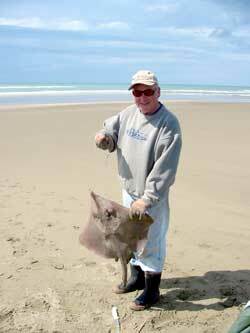 It is looking like Labour weekend will be great for kitefishing on the east coast. The forecast over the whole country is for moderate westerlies on Saturday and Sunday with a possibility of a south to southwesterly wind shift by Monday. 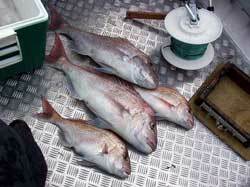 The schooling snapper are in close on the east coast from North Cape to the Bay of Plenty. Paul's top spots for the weekend are Pakiri Beach, Te Arai Point, Waipu to Whangarei Heads and further north Tokerau Beach. Now that the snapper are in great catches of schooling fish should persist until March, so it's a great time to get back into kitefishing if you packed up through winter. It was daybreak on Wed 19th September and the northerly wind that had been forecast was already blowing straight into the ramp at Kawakawa Bay. A quick departure was required and I was shortly anchored a couple of hundred metres off Ponui Island. I baited my Boat Longline Target Hooks with last week's frozen mullet and trevally. It was in the water 10 minutes later and then I was fishing from the rods. After 45 minutes I lifted and unhooked the first grapnel then pulled the line from the other end. I do this when it is windy so the longline can drift as I haul it in and I don't have to drive the boat at all. I had a reasonable haul of five legal snapper on the first set and was thinking of departing as the wind freshened. Then I looked at the remaining bait and decided I had nothing to lose by doing another set. I had the line 3/4 deployed when a black cloud passed across the bottom of the screen of the depth sounder. What was that? Around 40 minutes later I lifted the first grapnel and felt the tug of a real fish and not too far away either. I kept on pulling until I could see the silver red flashes in the clear water and landed a 6.5lb beaut. Letting the line go free from the boat I motored to the other end. Once the grapnel was lifted I could feel the same nodding as I had on the other end. An 8lb snapper. With this fish and some nice pannies, I had my limit of nine and was on my way home by 9.30am. It was a great catch and ample proof that having 25 baited Target Hooks certainly multiplies your chances of getting a bait in front of a fish. I don't need to mention that I never got a bite on the rods. It's Wednesday and we have a 10 knot westerly with slight sea and a half metre surf running. The water visibility is very good for the divers. On Saturday we had at least 10 kites and kontikis fishing from the beach and a few less on Sunday. 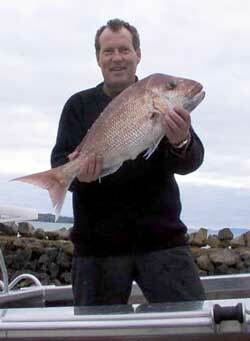 Some fishers caught their limit bag of fish, but there were no reports of any snapper landed. Interestingly, fishing further out to sea on boats is patchy despite the kite and kontiki fishers doing well from the beach. Harry Job from Hastings came down and set up his tent in the free camping ground overlooking the beach. Harry came for a weekend of fishing using his Kite Dropper Rig. He had good catches on Saturday and Sunday. Rodger Gardner from Hastings caught seven good gurnard, a skate and a few red cod from one set on his new Kite Dropper Rig. If you catch a red cod, keep it, it is great eating. The best way to deal with red cod is gut and clean the fish and store it in the fridge for at least 24 hours. Don't try to eat it fresh as the flesh is too soft. This fish is excellent smoked, but again leave it for a day in the fridge before smoking. Don't forget our kahawai contest finishes on Monday the 28th October so you have the whole weekend to beat the winning fish of 3.42kg. The kahawai has to be caught off Porangahau Beach and be weighed in at our shop. We are going to run another contest as the kahawai one was so successful. This time it will be for snapper landed off the beach and will run through to the end of January. I will provide more details in subsequent newsletters. Good fishing over the long weekend. If you break any gear, or need anything, we have all Paul's Fishing Kites rigs, kites and spare parts in stock. Over the years many kitefishers have found the benefits of floating baits above the bottom. Putting floats on the traces prevents them becoming tangled or wrapped around the mainline Floating the baits can help prevent paddle crabs from stealing them while you are setting. Floating baits are also great when surfcasting in crab infested areas. To assist kitefishers who want to deploy some of their baits off the bottom we have imported a new floating bead. These flouro red beads are 18mm in diameter and have been given the float test for bait sizes. A single floating bead on a trace will lift an average size bait. Two floating beads are recommended for larger baits such as baby squid. The new floating beads are available in a packs of five beads for those who want to tie their own traces and are also available on a complete pre-tied trace with a 5/0 hook, one or two beads, clip and swivel tied to the correct length for our trace racks. Just recently Paul's Fishing Kites have changed from using snap clips to coastlock clips for attaching the kites to the kiteline. The new coastlock clips have been rigorously tested and have more than twice the strength of the best quality number 6 snap clips available. We tested the new coastlock clips to 75 kg and they showed no signs of letting go. For those who have found the snap clips to be quite fiddly and difficult to use, these new clips should make your fishing a whole lot easier. Much stronger, easier to use and a very cheap insurance against losing a kite. On Sunday 13th October Alan, David Billings, Jamie Cullen and I went to Uretiti Beach. The first set of the Kite Longline Rig was put out to 1000 metres, it returned nothing so I put out the next set out to around 1800 metres. We caught one snapper at 1.0kg and one gurnard. David got a similar catch. I had to leave as I had go back to the farm and milk the cows. Alan came back with me and we left David and Jamie to fish. The boys were using my bait and were fishing over a reef. They caught some dark kelpy type snapper up to 10 pounds. David and Jamie ended up with their limit for the day. At one stage they had 10 fish in a row with four of them a very good size. They were caught around 1400 metres out. The wind was west to southwest and a right hand tack was needed to ensure the gear went out straight. The weather was not that pleasant with showers on and off all day and a cool wind. It appears that the bite time was two hours after high water as full tide was at 2.30pm. 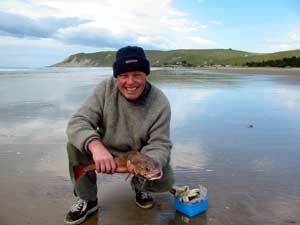 The total number of fish caught for the day including my two was 19 snapper and one gurnard. Alan found two very excited lads when he went to pick them up. Some photos were taken and they will be sent to you when I have them developed. Interestingly all the snapper had extra large roes in them. I have never seen roes so big, massive. The roes were twice the size of a sausage! The winds in the Bay of Plenty are notoriously fickle, not only in direction - but also in wind speed. This makes it very difficult to determine the amount of plastic bag to be used for tacking when the wind is so variable. On Saturday 19th Oct, the wind in the morning was quite strong, about 20 knots, by midday it was down to about 8 knots but by late afternoon had increased to 20 knots once again. In these conditions I have found it better to tack the kite using just a very small piece of plastic bag, about 50mm wide. To use anything larger invites the kite to have a swim. The wind was blowing slightly offshore and required a tack of 60 to 75 degrees, even with such a small piece of plastic this was achieved with ease. Other anglers using kontikis and bags went home as they could not manage the marginal conditions. My wife and I had two successful sets and several fish joined us for evening tea. I imagine tacking is one of the most FAQs in your shop. In my experience, starting off with a small piece of plastic is far better than starting large then removing some to suit the conditions. Many of the prime fishing spots in this area have high hills to the rear of the beach and then the wind velocity is many knots stronger 500 metres offshore. A good tack near the beach can be too much when the reel is locked and line stops running free a kilometre offshore, here the strain is considerably more, where the kite makes full use of all the extra wind. With kite anglers I have spoken to, tacking is always the number one question, and without fail they are putting too much weight or screwed-up polythene bag on the tacking rope. I find it very impressive to watch a kite flying in a south-westerly wind, and have the kite pulling hard as if the wind is actually blowing south-easterly, giving the impression it is heading into the wind. I have often been asked how I achieve that? Be interested to read your thoughts. 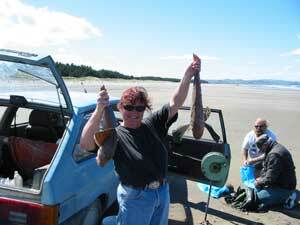 We went to Tokerau Beach last weekend and fished all day Saturday. We were using a Bottom Longline powered by a Nighthawk Kite. The wind was a straight southerly and very light. We put out three sets baited with squid. We left the first set out for two hours, no fish. The second set was left out for three hours on the turn of the tide (low). We caught two snapper, one weighed two pound and the other three pound. The last set was put out at 6pm and retrieved at 9pm. We landed 11 snapper ranging from four to six pound. So we found the best fishing time was at dusk. This is my first report, hope you find it of interest. We went out to Cornwallis Wharf on the Manukau Harbour at the end of last week. The wind was blowing too close to the beach so we went back to Cornwallis beach proper and launched the kite. The wind was extremely blustery so I had to let out more kiteline (to about 130 meters) to get altitude, there the kite settled pretty well. We were using a 65kg Dropper Rig with 13 hooks set to 1000 meters offshore at around 1200hrs. Left it out for one hour and then retrieved with great difficulty due to wind speed. It had increased to an estimated 35 knots. We brought in one good sized kahawai and an octopus with a tentacle span of around one metre. Quite a surprise. Talking to a couple of the locals it seems nothing has been caught lately at all. Just the one set was put out as the weather started to close in....packed up and went home. I would be interested in getting in touch with other kite fishers for midweek and weekend ventures around Auckland. I went fishing at Pukehina a couple of weeks ago. I got to the beach about lunchtime, the wind was almost dead offshore. We set Kite Longline Rig out baited with squid. I left it out about 90 mins then hauled it in with nothing. Set it out again, same bait, same distance and caught nine good gurnard, one kahawai and one snapper. Not bad considering I only rebaited one hook. On Saturday the wind was no good and had to go back home early Sunday, just as the wind was coming right. Thems the breaks. I read that Bob Garratt battled the Wairarapa norwester for some fish. It is a challenge to launch successfully on the Wairarapa coast, though we may hear about some more successful sets soon. One thing to watch at Lake Ferry is the debris that comes out from the lake. There are many sunken 'treasures' near the outlet, but it's okay once you move away from there. Kitefishers in the South Island will be pleased to know you have an outlet close to home where you can get all your kite fishing gear. Stirling Sports in Nelson are now stocking our small Dropper Rigs and videos. See Darren and the team for all your kite fishing requirements. 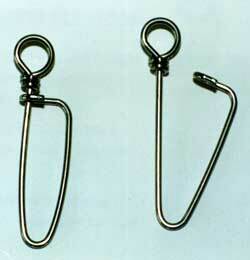 Stirling Sports in Wellington have the Target Snapper Hooks in stock now. See Mark and the team for your fishing needs. Thank you to those who responded to our request for more Beach Reports.